The third season of Marvel’s Agents of S.H.I.E.L.D. is clicking along on Tuesday nights with interesting new developments for its characters, and this week looks to be taking on a classic science fiction idea. 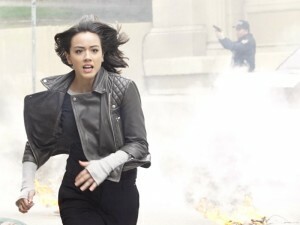 After Daisy (Chloe Bennet) gets a glimpse of a possible future, the team works to change their fate and prove that the future is not fixed. 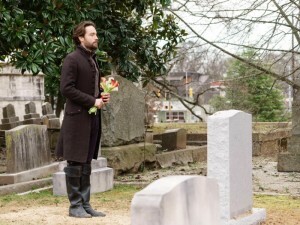 Also this week: Sleepy Hollow wraps up its third season with the loss of a major character, while on The 100 Jaha tries to convince Abby to join his cause. 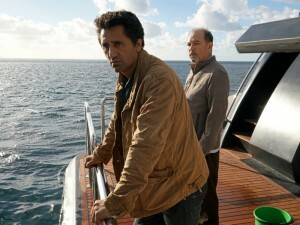 And while we’re still talking (and screaming and tearing out our hair) about last week’s finale of The Walking Dead, this Sunday night spin-off Fear the Walking Dead picks up its second season as the families scramble to make it to Mr. Strand’s yacht to escape the undead apocalypse that it burning like wildfire through Los Angeles. Over on Syfy, the new supernatural gunslinger series Wynonna Earp made its premiere last week and airs Fridays at 10/9c. 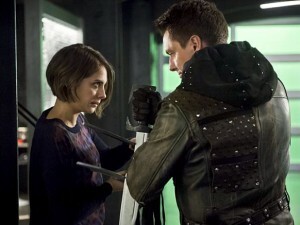 Head over to Syfy.com to learn more about the show. 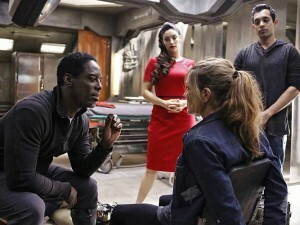 “Spacetime.” When Daisy gets a horrifying glimpse of the future, S.H.I.E.L.D. races to prove that fate is not fixed. THE FLASH returns with new episodes in two weeks. “Eleven-Fifty-Nine.” Oliver and Diggle learn that Merlyn is going to try to break Darhk out of prison. Meanwhile, Laurel gets a surprising offer and Felicity has a heart-to-heart talk with Curtis. “Progeny.” Rip tells the team they are headed to the future to take out a powerful ally that Savage needs in order to conquer the world. However, when Rip reveals the ally is a 14 year-old boy who will one day grow into an evil dictator, the team is split about the morality of killing a child, even if it does save the world. 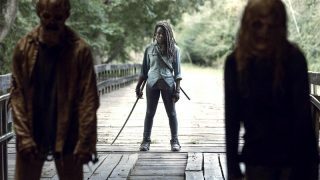 “Fallen.” Jaha employs a terrifying new method to convince Abby to join his cause, Kane is on a mission, and Bellamy is hit with a hard truth. Meanwhile, Monty finds himself in a precarious situation, and Jasper rushes to save one of his own. “Ragnarok.” After a startling discovery, Abbie and Crane realize what they must do in order to make Pandora’s box complete again. Meanwhile, the team works tirelessly to stop The Hidden One, before he destroys all of humanity. Can the Witnesses succeed with the fate of the world in their hands once again? “The Believer.” An Evangelical minister attracts more “true believers” to his tent revival with the power of his Wesen identity; and Nick and Hank have to get involved when all hell breaks loose. Meanwhile, Capt. Renard takes further steps to hold sway in local government; Eve borrows a page from Adalind’s book to gain more access to Black Claw. “Her Handsome Hero.” Belle turns to Rumplestiltskin with hope of finding a way to protect their child from Hades. Meanwhile, Hades secretly meets with Gaston in the Underworld and encourages him to seek revenge on Rumplestiltskin. As the heroes try to find a way to defeat Hades, Emma has a terrifying nightmare that she realizes is beginning to come true. “Monster.” In the second-season premiere, the families flee a burning Los Angeles on Strand’s yacht, as Strand remains mysterious. Meanwhile, the group encounters danger at sea.